Your students will practice finding the ratio, determining a specific term, and finding the sum of a geometric sequence. 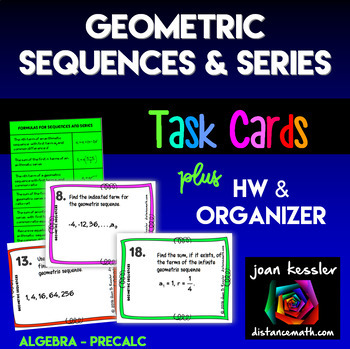 Four real world problems are included in this Geometric Sequences and Series resource. 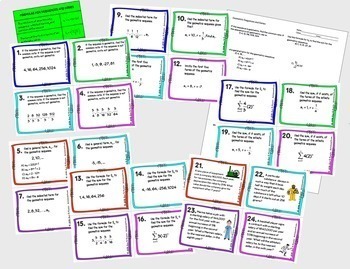 Activity Based Learning with Task Cards really does work to help reinforce your lessons. 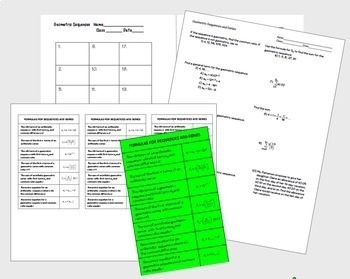 Task cards, station cards, and foldables get your students engaged and keep them motivated. • 24 Task Cards plus a blank card if you need an extra. #20 – 24 are applications. • Additional handout which can be used for a Quiz, HW assignment, or enrichment. 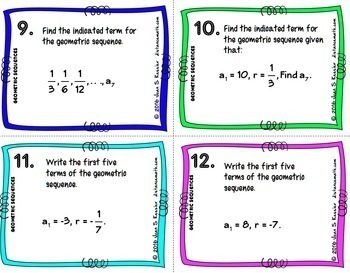 • Sequences and Series page for Interactive notebooks. ⇒ Click here to become a follower and be the first to hear about my freebies, sales and new products designed to help you teach, save you time, and engage your students. Did you know that you can earn 5% back for future purchases by leaving feedback? Your feedback is greatly appreciated. Thanks for shopping in my store! Custom requests gladly accepted. If you have any questions or comments please contact me by email me at: teachdydx@distancemath.com. ©2017 Joan Kessler (distancemath.com™). Please note - this resource is for use by one teacher only. Colleagues must purchase additional licenses or you may purchase licenses for them at a discount. Note: You may not upload this resource to the Internet in any form.